Team Suzuki Press Office – January 29. Team SUZUKI ECSTAR has today presented its new MotoGPTM project at the Sepang International Circuit as a foreword to the kick-off for the season, which officially starts tomorrow with the first IRTA test of the year here in Malaysia. 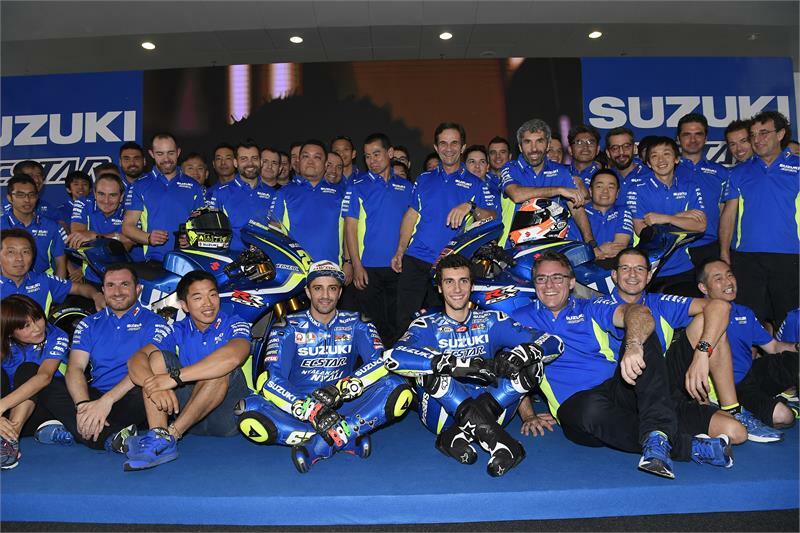 The Japanese team, led by Davide Brivio as Team Manager, Satoru Terada as Project Leader and Ken Kawauchi as Technical Manager, will begin the third season in the top category of motorcycling. After two seasons of creation, hard work and development, 2017 will be a crucial exercise in which Team SUZUKI ECSTAR seeks to become one of the best teams in the World Championship. Pursuing that goal this year, it has renewed its line-up of riders with the acquisition of the Italian Andrea Iannone and young Spaniard Alex Rins, coming from the Moto2 category. The GSX-RR 1000 will be contending among the top machines of the world again with a good basis and many improvements Suzuki wants to enhance the performance. Iannone, born in Vasto (Italy) 28 years ago, debuted in the premier class in 2013 with the Ducati Pramac and from the beginning he showed his credentials with an extreme, aggressive and exuberant ride that served him well, respect of his rivals and this permitted him to be amongst the fastest riders in the world. Four years later, and after winning his first race in the category last year in Austria, Team SUZUKI ECSTAR wants to be the launch pad for Andrea to aim for new targets and to be able to regularly fight with the top riders for podium positions. On the other side of the box will be Rins, a 21-year-old Barcelona teenager who begins his adventure among the world's best motorcycle riders. With a natural talent for riding, and several times as a runner-up in the lower-class categories, Rins looks to 2017 as a year of learning in the premier class to get the experience to fight for higher goals in the coming years.